For most of the residents of Tachikawa city, life seems to be perfectly normal. That's how it seems, but the truth, known only by a tiny select handful, is that this is a city at war. Every day, as the citizens go about their business, they are under attack by alien criminals and mysterious organizations seeking to conquer, enslave and destroy. But to combat these threats, a covert council has secretly selected certain individuals to serve as protectors. Wearing special suits that amplify latent powers hitherto unsuspected, they blend into the crowds and shadows, waiting until the call is given to fight again. They could be anyone: your neighbor; your best friend's mom; even high school students like Sugune Tachibana and recent college grad Joe Hibiki. And needless to say, schoolgirl artist Hajime Ichinose is probably the last person anyone would ever suspect of being a soldier entrusted with defending mankind. But she is, even if as the latest recruit she still has an awful lot of learning to do. Hiding like ninjas, powered by super-science, they are humanity's first and greatest line of defense. 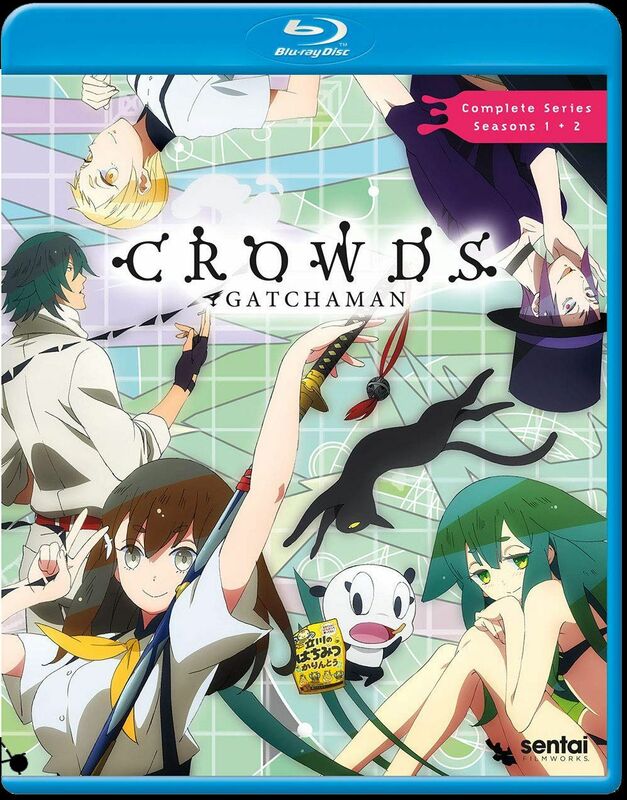 Gatchaman Crowds Insight (Season 2): You can't keep a good Gatchaman down, especially when a new organization called VAPE (short for Violent Ape) starts hijacking CROWDS technology. The ensuing wave of "Red CROWDS" incidents targeting high profile targets like the Prime Minister make it clear that the good team needs to start recruiting; fast. Fortunately, help arrives quickly, and with a rather... loud entrance. The alien Gelsadra's ship crashes in a rice paddy in Nijima! Besides being generally peaceful, Gelsadra has a unique power involving comic-book-like speech bubbles that display a person's inner feelings, rather like an emoji. There's also the fireworks enthusiast, Tsubasa, whose life becomes the focus of millions of viewers when she's chosen as the newest Gatchaman - on nationwide live television! As if that wasn't enough pressure for a teenage girl to handle, she's also assigned Hajime as her mentor! Will she survive? Will the world survive?